I've seen House Finch Disease before; in house finches. I've never seen it in a Goldfinch but apparently it has been documented. So, looks like I will be spending my Sunday cleaning/disinfecting all my feeders. 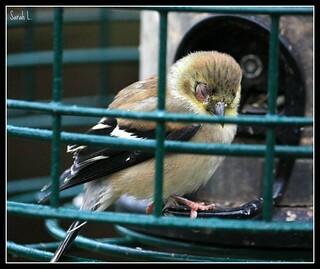 Hygiene of our feeders is essential to protecting our feeder friends from potentially spreading infections. You wouldn't eat at a restaurant that had moldy food on the table, why allow our birds to eat at unhygienic feeders? "House Finches are not native to eastern North America. Until the 1940s, House Finches were found only in western North America. Some birds were released to the wild in the East after pet stores stopped illegal sales of "Hollywood Finches," as they were commonly known to the pet bird trade. The released birds successfully bred in the wild and spread rapidly throughout eastern North America. Because today’s eastern House Finch populations originated entirely from a small number of released birds, they are highly inbred, exhibit low genetic diversity and, may therefore be more susceptible to disease than other bird species native to the East."